Starting 2011, ActionAid India, along with its ally, Samagra Grameena Ashram (SGA), has been working towards improving the quality of life of tribal communities in Kodagu and Mysore districts of Karnataka. The intervention also facilitated the formation of a state-level community-based organization, Karnataka Aranya Moola Budakattu Samudayagala Okkuta (KAMBO). KAMBO has been working extensively on the issues of tribal families working in the coffee plantations in Kodagu. 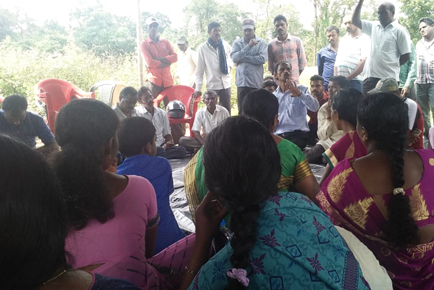 Since the entry to these estates is restricted, the members of KAMBO started contacting families of the labourers working in and around Ponnampet town in District Kodagu and had several rounds of discussions to motivate the community to claim their rights. The first batch, comprising 116 families, came out in 2016. KAMBO, thereafter, initiated a campaign advocating for land and other infrastructure for these families. In 2017, the campaigners managed to successfully influence the administration to provide 6 acres of land for rehabilitation of these families. All 116 families finally received land plots in Kunda village of Virajpet taluk, and work on housing, connecting roads, drinking water and other facilities is under progress. In the second phase, efforts were made to motivate 700 new families working in the coffee plantation to assert their rights. As a result, in October 2018, 176 more families decided to take the bold step, freed themselves from coercive employment and asserted their long-denied rights. All these families submitted their applications to the Integrated Tribal Development Department demanding land, new houses and other infrastructural facilities. The district administration, thereafter, identified 8 acres of land in Kedamullur village in Virajpet block to rehabilitate these families. The families have already begun putting up temporary houses there and leading a life of freedom. The struggle now continues for a permanent settlement for them and of course, to eventually improve the quality of life of all labourers working in the coffee estates.